First things first: a couple of links. Here you can read my column in this month’s issue of Prospect magazine, on the influx of foreign students who – like me – go to Beijing to learn Mandarin. While here you can see my photo essay on ‘young China’ – the theme of this blog – for the China Beat. I took those pictures over the two years I lived and travelled in China. “Past tense!” I hear you cry. “-ed?” Yes, I’m writing from London, where I will be based for two years before returning East. I thought I wouldn’t leave Beijing for love nor money, but one of those reasons is indeed why I’m back in Britain (you can guess which). Next, here is where we leave the six young Chinese who I’ve been following on this blog – stories from the generation that will change China. Ben is going strong in his online clothes shop. His bedroom business has expanded from just him and a leaky roof to a staff of three and booming sales. He still can’t pronounce the word ‘entrepreneur’. Leonidas is back on “my island”, as he calls it, off the coast of Shanghai. “No TV, no internet, no noise, no traffic jam,” he writes me. A perfect summer break before his final year at Peking University. Marie has finally ended her torturous job hunt, choosing a teaching position in Beijing. But she still dreams of working in Hong Kong, travelling to Japan, studying in America – depending on the day. Matilda has just finished her novel, Summer Fruit in Autumn. She posted in online, and got some encouraging comments from Chinese netizens. She still doesn’t know what to do with her life, though. Tony will be joining me in England next academic year. He has an offer from Cambridge and a provisional offer from Oxford, to read an MPhil in International Relations. I hope to see him before long. William dropped out of university for the second time last spring. His lifeless subject and doctrine-heavy classes simply weren’t for him. He’s now decided to give his all to environmental activism. Finally, a few quick stats and thanks. I launched this blog on the final day of the Beijing Olympics, August 24th 2008. Since then, I’ve had over 15,000 unique visitors. And 40,000 page views. My most read posts include a video interview with Chris Patten, commentary on the 20th anniversary of Tiananmen, a translation of a wronged student’s petition, and my essay in Chinese on China’s ‘New Youth’. My thanks go first to all my friends, most of all to those I follow here, who have helped me understand the nuanced and changing story of young Chinese in a new China. In the English language Chinese ‘blogosphere’, an especial thanks to: Jeff, Kate and Maura at the China Beat; Jeremy and Joel at Danwei; Elliot at CNReviews; Charlie at China Geeks; Evan Osnos at The New Yorker. And everyone else! As an interlude to the Diary of a Taiwanese in Beijing posts I’m running, here’s a little vignette from when I invited Wu Yi-jung – a Taiwanese exchange student in Beida – to join Marie and I for dinner one night. Marie has had a long-standing interest in Taiwanese and Japanese culture*, and was excited to meet Yi-jung. Her first question was about the Taiwanese chat shows and singers she loved. Yi-jung shot a wry glance at me – just that afternoon, she’d told me this was the most common question she got in Beijing. But she answered patiently, and we started talking about Sally’s recent trip to the Great Wall. I had hardly expected this to be a segway segue* into the topic of Taiwanese independence. Yi-jung wasn’t getting involved. “I’m afraid you’ll get angry with me”. “I’m afraid you’ll argue with me”. This was getting repetitive. I felt I had to intervene. (And yes, I was fully aware of the risks of being labelled a ‘foreign nation intervening in affairs which are not it’s own’.) It was tricky: I had to pick a topic different enough to break the impasse, but not so different as to be awkward. I choose poorly: tensions within the United Kingdom. Explaining the respective relations of England, Scotland, Wales, Ireland, and Northern Ireland, not to mention which combination is Britain, which is Great Britain, and which is the UK … this is difficult enough in English. In Chinese … well, I guess there’s only one way it could have been worse. A Scot could have been sitting next to us. * a quick note: it isn’t mutually exclusive for young Chinese today to be politically hostile towards, and at the same time culturally fascinated by, Japan or Taiwan. ** thanks to my Dad for pointing this out to me. And apologies to any Italian readers for butchering your language. What a foaw paah! Marie’s job hunt, that is. At the beginning of the week, I got a call in the library from a rather panicky Marie. She had been called in at short notice to interview – in English – for the handbag firm Coach, and wanted a dry run of her self-introduction before her interview began in half an hour. At one point, a momentary confusion between the words ‘impress’ and ‘express’ resulted in what I thought was an accidentally brilliant summary of the fashion industry: “I want to work in fashion because fashion is how people impress themselves”. Over a bite another night, Marie wasn’t hopeful: the interview had only lasted ten minutes, with Expo-worthy queues of applicants outside. She’s had six job interviews so far. And that very day, she took two maths exams – with more of both interviews and exams to come. Nor is the summer holidays any longer a light at the end of the tunnel: Marie hopes to begin work as soon as she graduates. It’s a hard knock life. I told her over dinner of what Ben had done: strike it on his own with an online shop on Taobao. Ah yes, she responded: lots of Beida students do that in their free time – and made a fair profit off it. But as a full-time enterprise? She couldn’t imagine it. No security. She wanted two things for herself: a good job, and to be in the same town as her roommate and best friend. Which means disappointing her mum and dad, who – like all mums and dads – are encouraging her to take a job in her home province of Yunnan. So why not stay in school, and apply for further study? I’ve observed – anecdotally – that this is what most PKU students I talk to plan to do. It’s what eight out of Marie’s fifteen classmates are doing. And Tony estimates only 20% of his classmates are looking for work after they graduate (Leonidas flips that figure to 80% … but his field – applied linguistics – is more vocational than Tony’s, who studies international relations). One such path beckoned last Saturday, when Marie interviewed for the Japanese interior decoration company Epco. She was terrified that the interview might be held in English, and asked me for a phrase or two about teamwork to use if so. Put on the spot, I included the cringeworthy ‘there is no ‘I’ in ‘team’ on my list – this confused Marie, who isn’t so confident in her English spelling. But she’s feeling confident in herself, spectacle-less after her eye-correction surgery over the summer (her parents footed the bill). We can breathe a sigh of relief: the interview was in Chinese, and the questions simple (“why do you want to come to Japan?”). But I myself was interested in the answer to that one. Marie told me she loved Japanese culture, which I got the impression she regarded as romantic – hardly something her grandparents would say. Plus, she’d heard the wages in Japan were high. So it’s a clear front-runner against existing work offers in Beijing, Kunming – capital of her home province, Yunnan – and far-flung Xinjiang. So does she still see herself under the cherry blossom in five years? Tellingly, her plan is to work for two or three years, then go back to school. True to form, her dream has changed yet again: now it’s economics at Harvard. And on a broader level, it’s a dream which is in line with what I’ve seen across campus at the elite universities of Beida and Tsinghua: that the light at the end of the tunnel isn’t work, it’s study abroad. * I have to ask: does anyone reading this want to hire me? “Beida doesn’t even have a single robot”, Marie complained to me yesterday over a bowl of noodles. “Does Oxford have a robot?” I had to hang my head and confess – I didn’t know if Oxford had a robot or not. We had gotten onto the topic by way of discussing Avatar: “my subject is Artificial Intelligence”, she told me, “so when I watched Avatar I was thinking a lot about robots”. There then followed a 101 in what constituted a robot. I didn’t take notes and would flunk the exam, but I believe the gist is: a robot doesn’t neccesarily have to think for itself or have the ability to learn independent of human guidance, but it does need to be based on the model of man. So were the ‘avatars’ in Avatar robots? (If you haven’t seenÂ the film,Â these ‘avatars’ are human-created bodies of an alien species which can then be controlled by a human’s thoughts from afar, as if that human is the alien.) Don’t be silly,Â MarieÂ chides meÂ – they’re organic, even if human-made. The end product of a living breathing avatar which can perform complex functions under a human’s guidance isn’t ‘artificial intelligence’ … but the process by which the human’s thoughts are transmitted into the avatar does fall under the definition of A.I. Marie and I are having noodles every evening this week to prepare for her spokenÂ IELTSÂ exam (International English Language Testing System) in early March, beforeÂ the longÂ Spring Festival holiday. Besides clarifying such essential vocab as “monster”, we practised grammar over her favourite choice of topic: the troubles of being a Chinese student. I have nothing but sympathy for her pronunciation issues, going as I am through the same ordeal the other way round.Â (“Do students not have free time over their holidays?” I ask slowly. Marie takes a confident breath and nearly shouts in indignation: “Absolutely lot!”) But she’s found a way to practise her listening and take a break at the same time: a new found love for Gossip Girl. 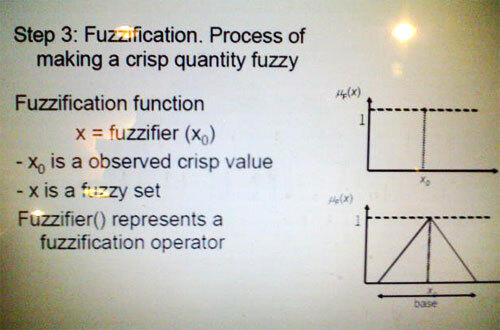 The fashion of Fuzzy A.I. Marie’s parents chose A.I. as her major (no doubt because of its ‘heat’), but Marie isn’t happy. Her dislike of the subject has a lot to do with the ten-hour a day workload, and the fact that she doesn’t enjoy maths – though I’m a little Fuzzy about the details. Ever since year one, she’s been toying with the idea of switching to law or, yes, literature. (Marie too loves ‘Gone with the Wind’, and is currently listening to an English language audio tape of ‘Pride and Prejudice’ which is read, for some unfathomable reason, in a Southern US accent.) But now she’s in her fourth and final year, and it’s too late to do anything about it. I’ve never written about youth fashion on this blog. A major reason is that my own interest in fashion extends to finding a pair of socks in China that fit my feet (no luck yet), but no further. And I won’t start now, having just admitted my utter lack of qualifications to. 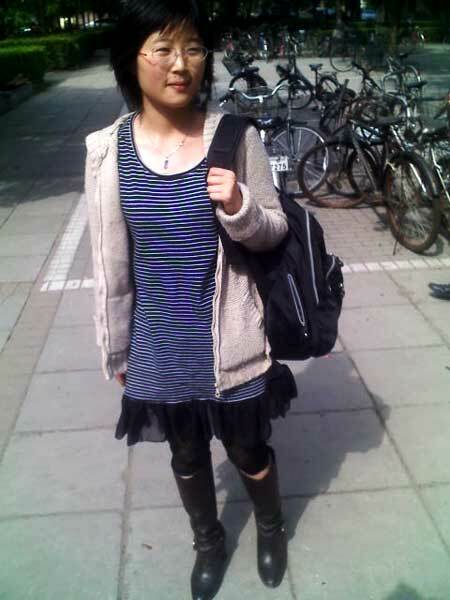 But I will observe that for the most part, clothes on campus at Beida and Tsinghua (especially Tsinghua) mean jeans and a top, or occasionally a pair of extra fluffy earmuffs for girls. It really is homogenous. So I would venture that Marie, and others like her (for instance, this girl I talked with in Beida’s coffee shop for enoVate) are exceptions in that they evidently pay attention to dressing nicely. I asked Marie how much she and her friends spent on clothes a month. About 200 kuai (a little under Â£20, in a very cheap clothes market) was her estimate; they shop for Western brand names but Chinese copies of them, as the originals are too pricey. I think I’ll ask her to look for socks for me. Following the lives of six young Chinese in Beijing – stories from the generation that will change China.